Welcome to the Fourth Italian day for the Internasjonal kulturkafé. Every Saturday the Internasjonalt Kulturnettverk in Stavanger coordinates a "Kulturkafé", a food event in collaboration with the ethnic minorities in Stavanger. Saturday 4th of MAY it's our turn! Join IKIS to celebrate the Italian National Day. Please bring your own food and your own drinks (it will be possible to buy some drinks from us). You are welcome to bring also some food (cakes, salads, breads, etc.) to share with everybody else. There is space where the kids can play so feel free to bring their toys. The event is free for members and non-members. Italian Families movie serie: This serie of movies is dedicated to Italian Families and how they are changend during the years. 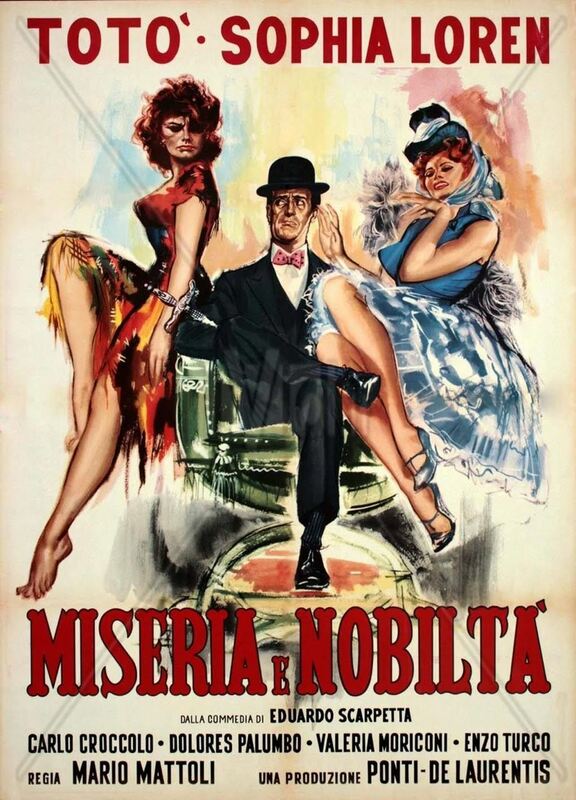 The story is taken from the Eduardo Scarpetta's play of the same name. Naples, second half of 19th century: the poor Felice Sciosciamocca tries to work being a scribe for illiterate people, while his friend Don Pasquale tries to make photographs for rich couples. Meanwhile, in the house where the two live, their wives start to fight because the apartment is mortgaged, and the women don't have money to pay the rent. Luckily, rich Count Luigino, in love with the beautiful dancer Gemma, asks Pasquale and Felice to stage a farce for him. In fact, the father of Gemma - an enriched cook - wants to meet Luigino's family, but he knows that his real father does not approve of his love affair with the dancer. So Luigino transforms Don Felice Sciosciamocca into his uncle (the Prince of Casador) and Don Pasquale has to play the true father of Luigino. The young count entrusts a false part to each of the members of the two families, except for the second wife of Felice, Concetta. Count Luigino cannot find a role for her, and Concetta gets very angry. While Felice and Pasquale are arguing in the beautiful villa of Don Gaetano, Concetta bursts into the home and tries to compromise the plan organized by Luigino. Don Felice manages to fix the situation and in the end all is resolved. 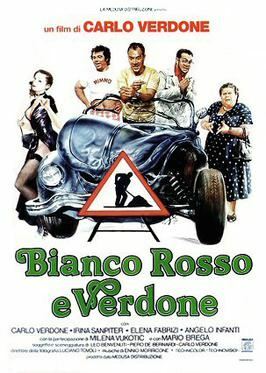 Filmkveld "Bianco Rosso e Versone"
Bianco, rosso e Verdone is an 1981 Italian comedy film directed and starred by Carlo Verdone, playing three characters. It was produced by Sergio Leone, soundtrack composed by Ennio Morricone and guest starred by Mario Brega, all formerly scored in the Dollars trilogy and spaghetti western movies in the 1960s. Italian election day in the early '80s. Three men leave to reach their voting places. Furio, a pedantic and chatterbox clerk living in Turin, is with his family on his way to Rome, so are half witted Mimmo with his diabetic grandmother. Pasquale, an Italian emigrant in Germany and married to a local valkyrie-like woman, leaves alone with his Alfasud car to Matera, South Italy. Theirs is an eventful journey through Italian motorways. 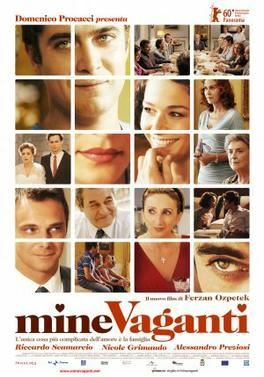 Mine Vaganti (loose cannons) is a 2010 Italian comedy film directed by Ferzan Özpetek. Özpetek also wrote the script, with the help of Ivan Cotroneo, while Domenico Procacci served as a producer. The film stars Riccardo Scamarcio, Alessandro Preziosi, Nicole Grimaudo, Lunetta Savino, Ennio Fantastichini and Ilaria Occhini. Loose Cannons premiered on 13 February 2010 at the 60th Berlin International Film Festival. The following month, it was theatrically released in Italy, Switzerland and Turkey. In the United States, the film premiered at the Tribeca Film Festival on 28 April 2010, where it won the Special Jury Prize. It was later screened at the Seattle International Film Festival, Provincetown International Film Festivaland Palm Springs International Film Festival. In October 2010, the film was screened at the London Film Festival. As a well established Christmas tradition, we want to spend some great time together exchanging wishes, eating good Italian food and playing Tombola with rich prizes. The dress code is elegant casual. Come da tradizione, anche quest’anno lo “Julebord all’italiana” sarà un momento comunitario per scambiarsi gli auguri, giocare a tombola per vincere ricchi premi e mangiare tanto buon cibo italiano. Lo Julebord 2019 è un evento per famiglie. Per i più piccoli verrà preparato un menù speciale insieme ad un intrattenimento a loro dedicato. Som en veletablert juletradisjon ønsker vi å tilbringe en hyggelig kveld sammen sammen med å spise god italiensk mat og spille Tombola med fine premier og ønske hverandre God Jul. 29 Mar 2019 Filmkveld "Roma città aperta"
25 Jan 2019 Filmkveld "The conformist"
08 Dec 2018 Julebord "all'Italiana"
30 Nov 2018 Filmkveld "Sicilian Ghost Story"
28 Sep 2018 Filmkveld "Cuori Puri"
25 May 2018 Filmkveld "Un Bacio"
23 Feb 2018 Filmkveld "La mafia uccide solo d'estate"
26 Jan 2018 Filmkveld "Boris"
09 Dec 2017 Julebord "all'Italiana"
24 Nov 2017 Filmkveld "Fuocoammare"
28 Apr 2017 Filmkveld "Saturno Contro"
27 Jan 2017 Filmkveld "Quo vado?" 17 Dec 2016 Julebord "all'Italiana"
25 Nov 2016 Filmkveld"Sacco e Vanzetti"
30 Sep 2016 Filmkveld: "Benvenuti al Nord"
05 Dec 2015 Julebord "all'Italiana"
27 Feb 2015 Filmkveld: "La gente che sta bene"
30 Jan 2015 Filmkveld: "Vallanzasca – Angels of Evil"
28 Nov 2014 Filmkveld: "Sole a Catinelle"
24 Oct 2014 Movie and workshop with Luca Vullo: "La voce del corpo"
26 Sep 2014 Filmkveld: "Il Capitale Umano"
29 Aug 2014 Filmkveld: "La Grande Bellezza"
25 Apr 2014 Filmkveld: "Il Mostro"
10 Apr 2014 Sølvberget Cinematek presents: "Fellini's Roma"
05 Apr 2014 Lørdagsjazz på Residence hotel. Corrado Lentinello Trio med gjester. 31 Jan 2014 Filmkveld: "Passaggi di Tempo"
30 Jan 2014 Oratorio "Morte e Sepoltura di Cristo"
14 Dec 2013 Velkommen til IKIS Julebord “all’italiana”! 29 Nov 2013 Filmkveld: "Che bella giornata"
25 Oct 2013 Tavola Rotonda: "Italiani a Stavanger - gioie e dolori"
27 Sep 2013 Filmkveld: "Si Può Fare"
31 May 2013 Filmkveld: "Divorzio all'Italiana"
05 Apr 2013 Filmkveld: "Matrimonio all'Italiana"
22 Feb 2013 Filmkveld: "I soliti ignoti"
25 Jan 2013 Filmkveld: "Valentino: The Last Emperor"
15 Dec 2012 Velkommen til IKIS Julebord “all’italiana”! 09 Dec 2011 Velkommen til IKIS Julebord “all’italiana”! 25 Nov 2011 Filmkveld: "Che bella giornata"
25 Feb 2011 Filmkveld: "Una moglie bellissima"